A Winter Gathering of New Music & Multimedia Performance featured a conversational/musical interlude on home with Thread Ensemble (Rachel Panitch, Andria Nicodemou, and Abigale Reisman), Ioana Jucan’s nostos//algos (devised with international collaborators), composer Kirsten Volness’ River Rising and Alone Together, and Adara Meyers’ Picture This. 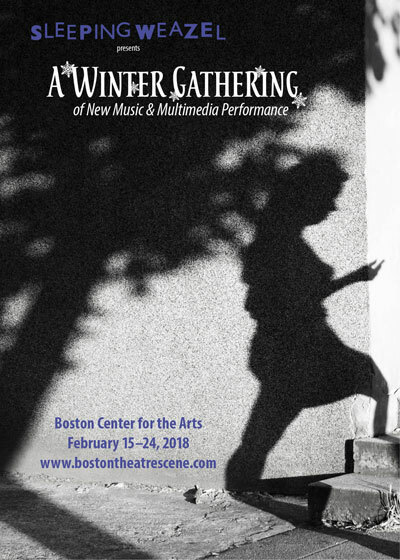 Curated by Meyers, A Winter Gathering brought Boston’s music and theatre lovers together to collectively experience enchantment, melancholy, and the tragic sublime through the power of personal testimony. Audience members were invited into the theatre vestibule (momentarily transformed into the “Word Memory House,” complete with warming refreshments) to write anonymous answers to questions such as, “What is home?” and “What is your earliest memory of playing?” Once seated in the theatre, Thread Ensemble read the answers aloud and improvised humorously poignant violin and vibraphone compositions based on them. Ioana B. Jucan’s nostos//algos (devised with collaborators Maurice Decaul, Juwon Jun, Amanda Andrei, and Jing Xu) is a multimedia ritual confronting, by turns contemplative and urgent, the fleeting realization that home is a place existing primarily in one’s mind. 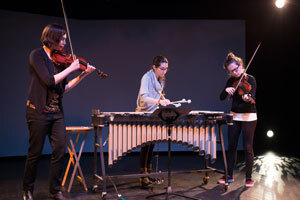 Performed by Ioana B. Jucan, Maurice Decaul, and Juwon Jun. 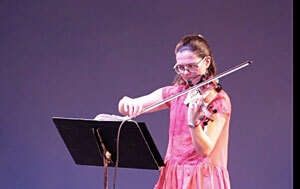 Kirsten Volness’ electroacoustic works for violin, River Rising and Alone Together, create moments of transcendence in their poetic qualities of loss, nostalgia, and the overwhelming crush of personal responsibility to take action for natural and man-made catastrophe. Performed by EmmaLee Holmes Hicks and Lilit Hartunian on alternate weekends. 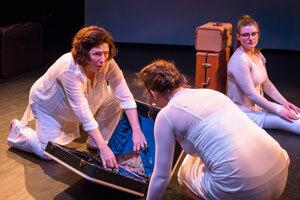 Adara Meyers’ Picture This, a tragically funny multimedia performance, uses “selfie” video footage and dance to explore memory and personal family ruptures dating from the Holocaust to the present day. 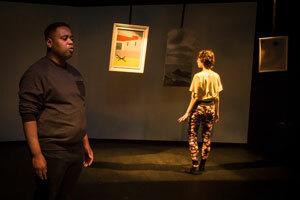 Directed by Natalya Baldyga, choreographed by Kimberleigh A. Holman, and performed by Adara Meyers, Blair Nodelman, and Veronica Anastasio Wiseman.